We are officially in the thick of summer! It is hot, hot, hot and when it’s like this, we try our best to cook everything outside on the grill so that we don’t heat up the house! I’m sure many of you can relate! So, with that in mind, I wanted to make a dish that was easy to make, yet so bold and flavorful that even my husband, who had declared himself “not a fan of shrimp” would become a believer! 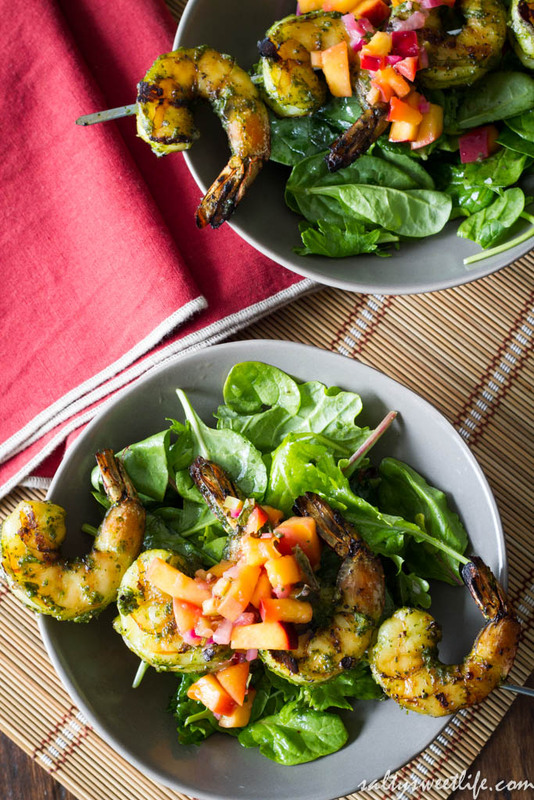 Sweet, succulent shrimp is marinated in a bath of cilantro, Thai basil, garlic and Ponzu; grilled over a hot flame, then topped off with a sweet and spicy nectarine chutney! 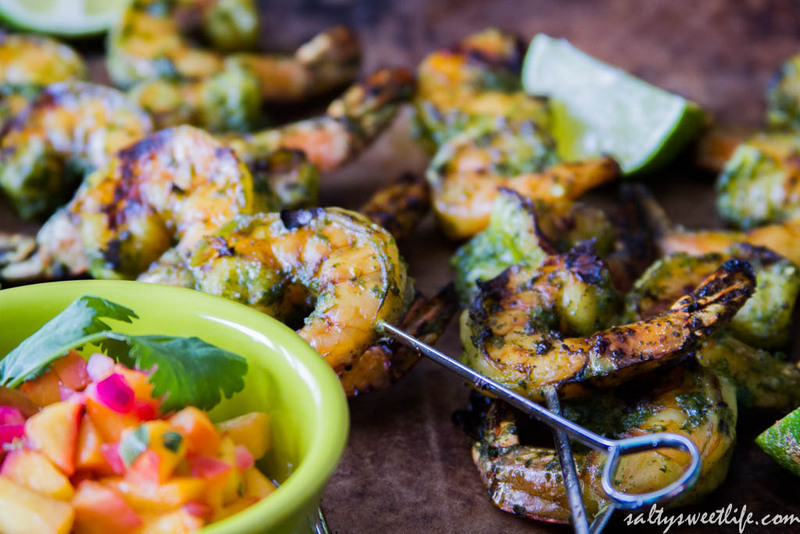 It’s a perfect summer meal–light, flavorful and kicked up with just enough spice to keep things exciting! If you’ve never had Ponzu before, you must give it a try. It is a Japanese condiment that is made from vinegar, lemon juice and sudachi, a Japanese citrus fruit. It has a light citrusy flavor that really compliments the shrimp; plus, the ponzu doesn’t “cook” the shrimp the way that adding fresh lemon or lime juice would. It’s easy to find in the Asian or Ethnic food aisle in the grocery store. For the marinade, I used about half of a bunch of cilantro that I bought at the grocery store. You don’t even have to remove the stems, just wash it well and toss it into the food processor. I chose Thai basil for its peppery flavor and because it’s growing like crazy and taking over my herb barrel! Sweet basil will work just as well. Because I like things on the spicy side, I used a whole Serrano chili pepper, seeds and membranes included. If you want a milder marinade, discard the seeds and membranes, or simply use half of the pepper. 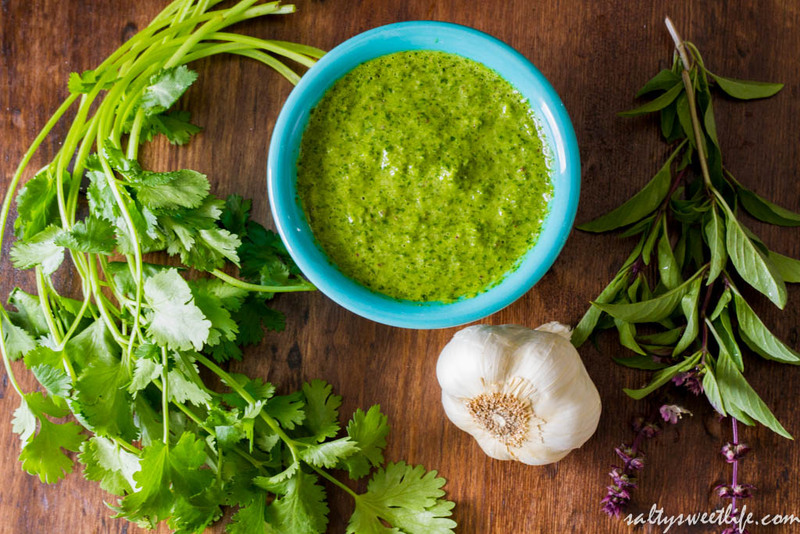 This marinade is also very versatile! I’ve used it on both chicken and pork with delicious results! In addition, the chutney makes a wonderful companion to seafood, chicken and pork! It’s so delicious, you’ll want to eat it by itself! Place 2 cloves of garlic in the bowl of a food processor fitted with the chopping blade. Pulse until the garlic is minced finely. Add the cilantro, basil and Serrano pepper and pulse until everything is finely chopped. Add the oil, agave syrup, salt and pepper and puree until smooth. 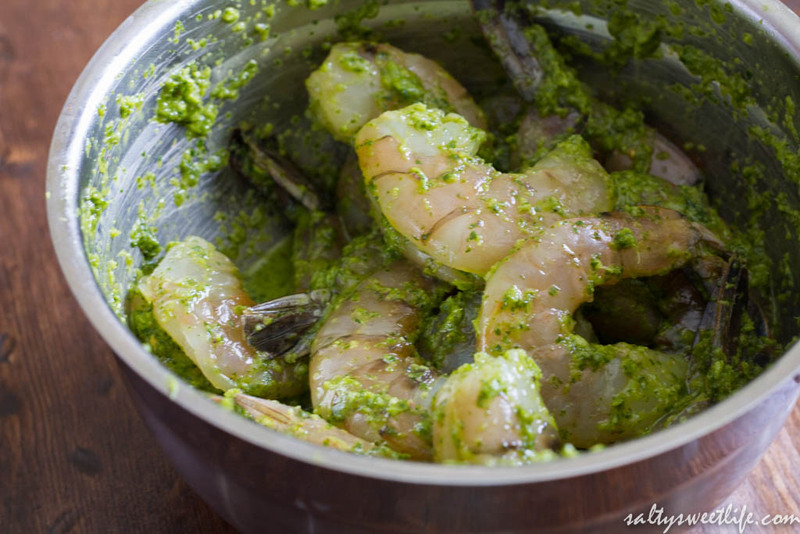 In a medium bowl, pour the marinade over the shrimp and stir to coat. Allow the shrimp to marinate for no more than 30 minutes. While the shrimp is marinating preheat the grill on high to 450 degrees. Be sure to oil the grill grates with canola oil. In a small saucepan, combine the chopped nectarines, Serrano pepper, onion, ginger, garlic, brown sugar, salt, pepper and lime juice. Over medium low heat, cook until the sugar has dissolved completely and the mixture comes to a slow simmer, about 10 minutes. I started with one teaspoon of brown sugar. Add a little more sugar if your nectarines aren’t very sweet. Remove from the heat and stir in the chopped cilantro. 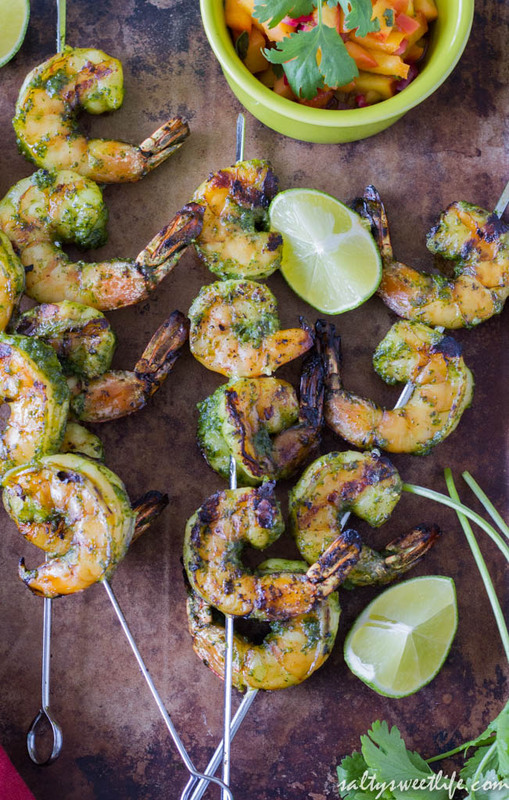 Thread the marinated shrimp onto the skewers. Sprinkle with a little more salt and pepper, then place on the hot grill. Allow the shrimp to cook undisturbed for 2 minutes, then flip them and grill the other side for 2 minutes more. Top the shrimp with a generous spoonful of the chutney. After many years of using bamboo skewers for grilling, I finally bought some inexpensive metal skewers and I am so happy I did–they are so much easier to work with. If you do use bamboo skewers, be sure to soak the skewers in water for at least 30 minutes before grilling to prevent burning. 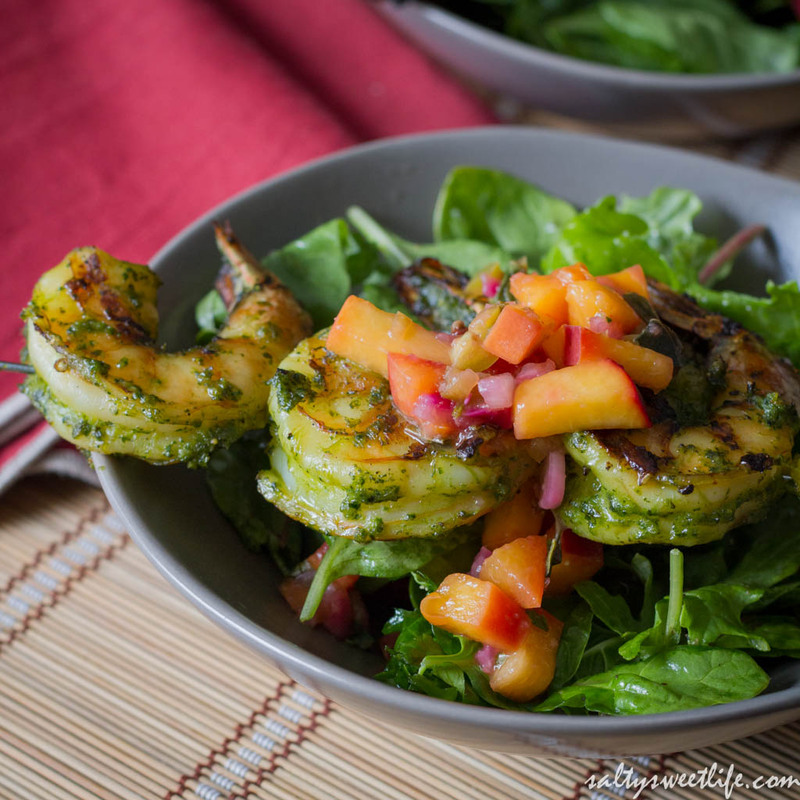 This dish was such a hit and it received rave reviews from my “not a shrimp fan” husband! This looks delicious! Thank you for including the link for ponzu. I didn’t know what it was. 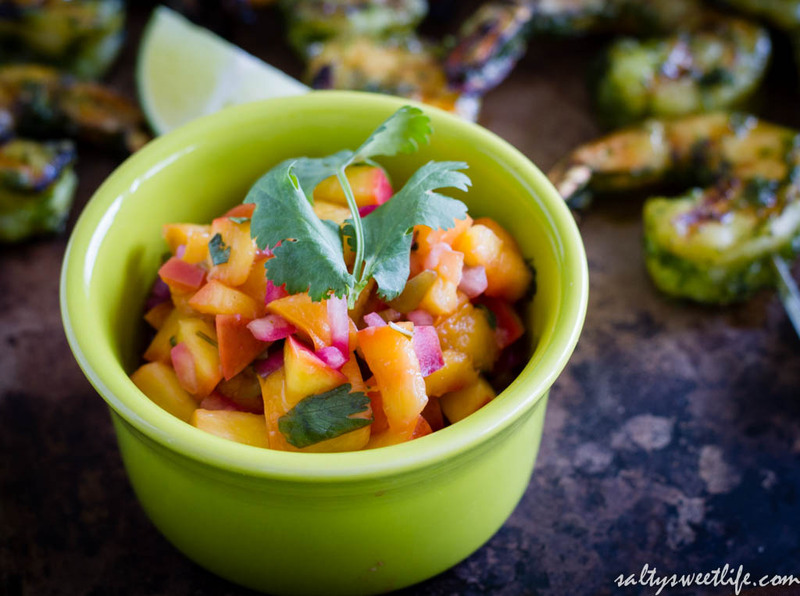 I love fruit salsas with seafood! I’m glad it was helpful! I love fruit salsas as well! This one is a definite keeper and it works with so many different proteins! Seriously Tracey? This looks so freakin’ amazing! I love love love cilantro. This would definitely make the perfect summer dinner. Christine we use cilantro so much because we love it too! It was a great light lunch for us! Glad you liked it! Wow!! This is beautiful! Your food is blowing my mind.